We’re matched! We’re matched! I just remember that feeling of elation like it was yesterday. After a round of “matching” 3 months earlier and our family not being “chosen”. It was a day I tried to remain guarded…tried. My heart was already out there…loving these precious, precious children. And with one phone call, one beautiful little girl became our daughter in an instant. God richly blessed us with our Carli Mei Grace Harris. She is living, breathing joy. 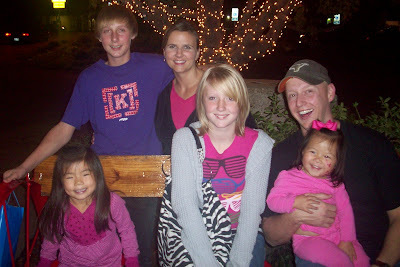 We had been through the adoption process through the Non Special Needs program back in 2005. But we knew if the Lord ever allowed us the opportunity to return it would be through the Special Needs program. I will be honest. Our first adoption, I was concerned that our Non Special Needs daughter would be in poor condition. And nutritionally and physically, she was. But with proper nutrition and stimulation and love…she blossomed. I don’t think our first adoption my heart would have been ready to accept what I thought of as a Special Needs child. I had pictures in my mind of severe…very severe needs. And there are those children in the program…they deserve no less love. But, there are many, many special needs that are very manageable. For us, for our family, we were pretty open to many different special needs. We petitioned for 16 children off our agency’s list the second time. We would have loved any one of them whole heartily. I would be dishonest if I didn’t tell you that our little Mei Mei wasn’t the cutest thing I’d ever seen. She was full of joy….overflowing joy…you could see it, you could feel it in her photos. 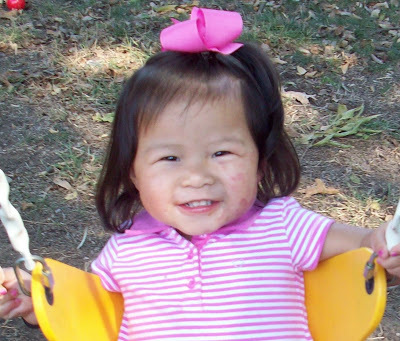 Her special need was listed as a hemangioma. It was located on her left face, scalp, ear, neck and upper chest. I did research on the Internet, visited the library, spoke to families on the birthmark yahoo groups, called and consulted with our pediatrician and a few of the best known vascular anomaly physicians. According to her photos that each doctor reviewed, they all were in agreement it was probably a port wine stain birthmark rather than the hemangioma they were diagnosing her with. Each doctor also let us know that they may or may not be able to fade the birthmark through laser treatments. It wasn’t because of her physical beauty they suggested the treatment. It was because of side effects of the birthmark such as thickening, nodules, bleeding, and distorted tissue from the pooling of blood. There were other possibilities such as Sturge Weber Syndrome and seizures that we kept in mind as well. When we received the phone call, our coordinator told us we would have to choose from 4 of the children we had petitioned for. I hung up and for two hours my husband and I prayed for wisdom to know which child, talked about them, imagined each one in our family, pictured them growing up as a Harris. I couldn’t do it. He felt very strongly about Mei Mei (how Carli was listed). I trust him but I still couldn’t utter one name out of four knowing one would be “chosen” and the other three would still be waiting. It is too much for one Momma to handle. We then decided we would speak with the coordinator and ask her who would be the most difficult to place. Who would most likely go without a family. And she never even took a breath and spoke “Mei Mei”. 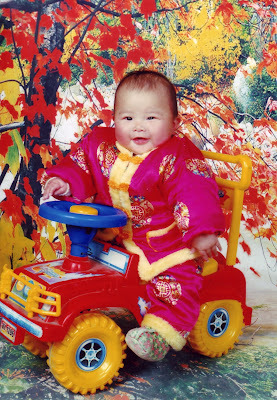 Please keep in mind the other children in our group of 4…one had severe bilateral cleft lip and palate, another had unilateral cl/cp, another had cl/cp that had failed during a surgery to correct while in China along with multiple other deformities. I immediately knew that my husband’s heart had been right, the Lord had given him our daughter…he brought scripture to me to verify his choice earlier but her confirmation is what eased my heart into choosing one….our one….our Mei Mei. Our LOI had been sent into China and now we would wait….for what seemed like forever. We waited 170 days before our LOA arrived, about 6 of the longest months I have ever endured. We were ecstatic to finally receive it and then we waited another 6 weeks before we left for China. Once in China, I realized why they listed something as normal as a birthmark as a special need. She was gawked at, spoken to and about all with looks of disgust on their faces. It is enough to make your stomach turn. I realized then, that physical beauty is put far above any character trait, any condition of your heart, and any level of intelligence. It broke my heart when our guide told us that Carli would not be eligible to attend school because of her “facial disfigurement”…seriously, a birthmark. I wonder how it is God allowed us to parent such an incredible, amazingly bright, beautiful child. I know it isn’t because we are worthy. We are so thankful for her…words would not do our hearts justice. Carli has been home with us for 8 months now. We have taken her to the pediatrician and specialists. She has had blood work, MRI, xrays, ultrasounds, eyes dilated and laser treatments. She doesn’t have Sturge Weber Syndrome, she doesn’t have glaucoma, she does have kidney stones from the melamine, she does have tubes in her ears now, and she may be near sighted. She has now had her 3rd treatment this month and the response is amazing. It is fading very well and for the most part, unless someone sees her the few weeks after treatment, they might not even notice her port wine stain. I know our family doesn’t see it anymore. But even if she had all of it…every possible thing they told us she could have come home with…would we love her any less? Of course not. She is our daughter. I think the biggest thing you can take from our experience is this. If you feel led, if your heart is telling you to pursue special needs adoption, if you get that peace from the Lord calling you to adopt a waiting child. Answer the call, pursue the adoption, follow your heart….you will never know nor could you ever imagine what amazing and incredible things He has in store for you through the life of that child.